On Friday of this week I was attacked by a swarm of angry, African bees. Obviously the protective gear did the trick or I wouldn’t be writing this article. Your fearless, raving reporter was hot in pursuit of solving the mystery of, why bees are disappearing on this continent in alarming numbers – I may have solved the mystery. Three months ago I started an article on local bee keeper, Javier Morales. Some friends had an infestation in their rural ranch house and I was trying to help. I contacted a local pest control service to assist – despite many assurances they never did show up, so I went to the local expert. 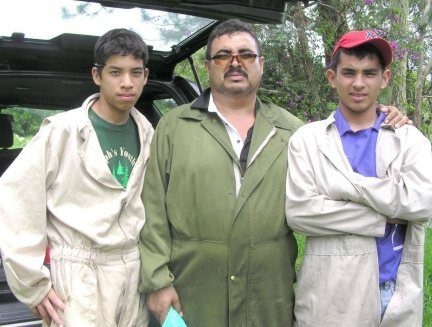 Javier came to the ranch house with his two sons, and placed some chemicals in the opening in the wall. Bee keepers are a breed-apart from the rest of us –for one thing Javier would not accept any money for his service. He felt an affinity with bees and getting paid to destroy them was something he couldn’t in all conscience be rewarded for. At the time I told him that their was wide spread concern in the US because bees were going absent-without-leave in alarming numbers. “Colony Collapse Disorder,” as it is called, is now reaching alarming proportions. The loss of honey is just a small part of the problem. As anyone who remembers the lessons learned in school The single most important aspect of the bees life is the pollinating of plants, fruits, trees etc. If the bees disappear then we face an ecological disaster. At that time in May of this year Panama didn’t have problems with its bee colony’s. That was then, this is now. When we met again this week, the situation has changed dramatically. 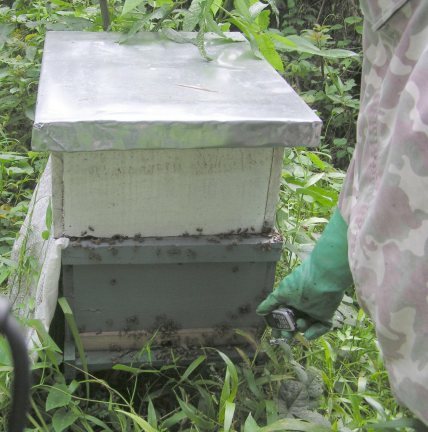 He tells me that some hives were seeing a 50% decrease in activity. I figuratively rounded up the usual suspects for him and enquired about pesticide use. This he said was not the culprit. All the farmers that use his pollination service are careful not to use chemicals that might endanger honey production. Javier was not aware of any “mite” infestation of the hives. Logic would suggest that if there where problems with mites then some visible evidence would be found inside the hives. Another of the usual suspects I thought might be cell-phones or radiation from the growing profusion of towers that pollute our landscape. He did mention that when attending his hives, if his cell phone rang, he noticed that the bees became disoriented. This is one thing that seems to be evident, the bees leave their hives in a normal manner but then, for reasons still unknown, can’t find their way back home. The cell phone experiment. 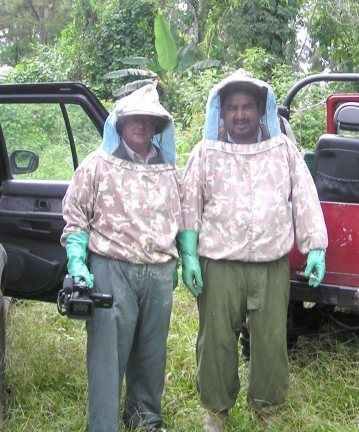 To test this theory I asked Javier to accompany me to some of his hives in the village of San Vicente, near Volcan. I took a video and still camera with me and placed a cell phone near the entrance to the hives. A friend, a respectable distance away, then called the cell-phone. On the first hive, there didn’t seem to be too much evidence of confusion so we crossed to another hive where the activity around the small entrance hole was much greater. When the cell phone rang, the reaction was immediate. The first thing I was aware of was that large swarms surrounded my head and were obviously not happy. I dutifully did my journalistic thing and took the necessary still and video shots but then the swarm became even more agitated. (perhaps I hadn’t cleared things with their public relations people) I made an orderly retreat from the hive and walked away. The mad Africans came with me. I was nearly back at my vehicle when I realized that my cars keys were inside my protective gear and the windows to the car were open. All it takes, I am told is about 20 or so stings and you are dead. Are cell phone towers the cause of the bee problems? Only careful scientific study will reveal that, but one small fact has since come to light to support this conclusion. 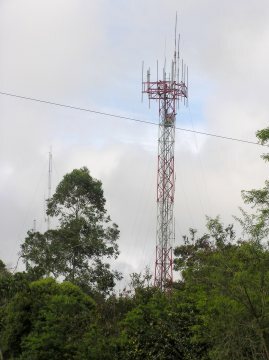 In may of this year there was no problem, but since then, four, cell towers have been erected in the area. Cell phone users in this area now experience strong and clear signals. Chiriqui, is the most important agricultural area in all of Panama. If the loss of bees continues at the present rate, we could see a total extinction by the end of the year. I will continue to investigate this problem and keep readers informed.